Customized 47 inch arc auto open floral patterned ladies umbrellas work great for marketers who are serious to woo their women customers. 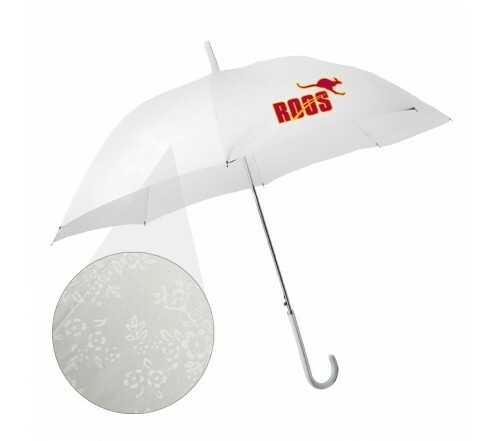 This umbrellas lends styel to their business messages and makes it stand out with its floral pattern canopy. Offered in attractive light and bold colors, you can easily choose the one for your campaign. It works great for fashion stores, beauty salons, spa, hotels and others. Save on wholesale orders of these custom ladies umbrellas. Request a quote to know what you may save by bulk ordering these custom 47 inch arc auto open floral patterned ladies umbrellas. Features - Auto Open. Stylish leatherette covered hook handle. Debossed pongee fabric with floral pattern. Eight (8)-panel umbrella.